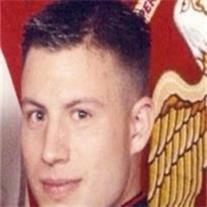 Waits, Andrew Michael, 29, a native of Phoenix, went to his next duty post on August 22nd, 2011. Andrew graduated from Camelback High School and then served his country as a United States Marine. He most recently was the owner of Mulligan’s Brick Bar in Scottsdale. Like the Phoenix that he was, he will live on through the gift of organ donation. Five Arizona residents have benefitted from his generosity. Andrew is survived by his son Phoenix, parents Mike and Lorie, siblings Dustin, Rusty, and Lindsay, grandparents Harold and Phyllis, Ralph and Karen, and Mildred. A celebration of his life will be held at Biltmore Nazarene, 5604 N. 24th street, Phoenix on Thursday, September 1st at 10am. In honor of Andrew, please dress in celebratory attire. Friends and family are also invited to gather at Mulligan’s Brick Bar, 7318 E. Stetson Dr, Scottsdale at 5pm on Thursday evening. The family asks in lieu of flowers a donation be made to his son Phoenix Waits, Wells Fargo account #7862403198, routing #122105278. Arrangements by Bunker’s Garden Chapel.